In a heatwave week, I've been out drinking every day. It's time for one of my infrequent meetings with BestMateFromWork. He started in the job earlier than I did, and is somehow still there, to his mixed delight and sorrow. We plump for a geranium-fronted pub in Marylebone, thankfully just as they turn off the big-screen World Cup match and switch the audio to Africa by Toto. The pub does not sell Becks. We find a seat in the empty alcove beside the bar, only to be joined shortly afterwards by a gentleman whose usual hideaway this is. There is much to discuss, including the moving of house, the construction of shed, and the impending of marriage. Discussing the minutiae of work is generally off the menu, plus he's now working from home so there isn't as much gossip as there would have been previously. BMFW drinks fast, always has, but I'm pleased to be keeping up by matching pints with bottles. As 7pm ticks round the football is turned back on, and our neighbouring cider drinker switches into excitable mode, offering unwanted tactical advice and cursing the referee's less convincing decisions. He has no off switch. Through the window I spot a well-known BBC weatherman, post-shift, in shorts and purple trainers, supping sequential beers at the adjacent outside table. My surprise is compounded when I spot that his drinking partner is a former BBC weatherman, whose name I can't initially remember. I bet they're discussing all things meteorological, and more, but a pane of glass safeguards their conversation from us, and ours from them. Two packets of freakishly flavoured crisps sustain us. My hiccups begin during the fifth bottle, so that's where we wrap things up, walking out of the pub just before the twin screen footballing drama climaxes. Cheers, thanks, until next time. I spend the entire journey home trying, and mostly failing, to keep my diaphragm from involuntarily contracting. It's time for this week's trip round to BestMate's for dinner. It's good to catch up, plus he finds it a good excuse to stop talking to America on the computer for work. At this time of year I enjoy my walk down the Greenway to get there, and tonight's blue skies are cracking, but it is the first time I've been stopped by two badged Mormons along the way. They get short shrift. I arrive within one minute of the allotted time, politely late rather than early, and hike up to the flat. Dinner is in the pan, and partly chopped in bowls to one side. Life is good, indeed BestMate had a bit of an unexpected triumph at the embassy last week, so tonight's beverage option has been upped. Normally a bottle of wine comes out of the fridge, or cupboard, depending, but this time a bottle of the fizzy stuff emerges. We still drink the stuff out of crappy tumblers, of course, all the decent glasses having been unaccountably smashed. There is much to discuss, including the de-greying of beards, the taking of holiday and the Ubering of cheese. Easily his best anecdote is how he ended up going bowling on Sunday night with a random former member of the cast of EastEnders. Eventually the spaghetti gets added, and a fine meal is delivered by tray to the sofa. We end up watching some tacky repackaged drama on a high-numbered satellite channel, then something newer but no more highbrow on a former terrestrial. I don't usually get the chance, so every commercial break is spent slagging off the adverts to an audience. A dish of profiteroles emerges for afters, confirming the specialness of the day. And when the full moon has risen high above the rooftops, and the Uber with the box of cheese finally arrives, I take my leave. My journey home requires public transport, rather than the Greenway at dusk, and is thankfully entirely hiccup-free. I had been planning to go out for a meal with my Dad. 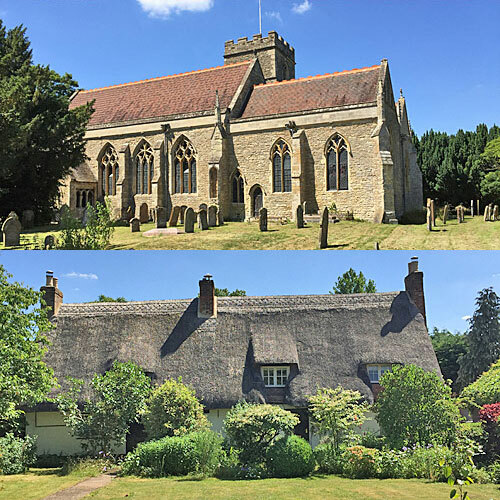 Instead it turns out that, if you live in a Norfolk village and are over a certain age, a communal lunch of decent size is served up every Wednesday, after which there is no need to partake of a serious meal for several hours. We head instead to the supermarket to buy food appropriate for later, and just for a change I nudge a bottle of Becks into the trolley. The East Anglian countryside looks dazzling under a bright blue sky, the dry fields more golden than green, and with a welcoming breeze to take the edge off. Once back at home I locate my favourite mug on the shelf and fill it with tea. The cleaning lady has left me a note asking if I wouldn't mind climbing up onto the worktop to clean the upper half of the kitchen windows. The tomatoes need watering. There is much to discuss, including the mending of printers, the whiteness of shirts and the precise whereabouts of a physiotherapist. The afternoon passes. The hosepipe needs moving. Broad beans are shucked. Only when the requirements of a radio producer's email have been dealt with can a start be made on dinner, which involves fish and crinkle-cut oven chips, plus veg. My bottle of Becks can only be opened with the aid of the family's ancient bottle opener, which was also once used to pierce tins of evaporated milk, and which I eventually manage to locate in the rear section of the cutlery drawer. From the local news we learn that the Royal Norfolk Show has been a big success, and that Danny Boyle is filming crowd scenes in Gorleston. Sufficient crockery has been dirtied for the dishwasher to be fired up, for a change, and a Magnum awaits in the freezer for later. My uncle's funeral has been an unexpectedly moving affair, the chief surprise being his coffin's arrival to the strains of Bat Out of Hell by Meatloaf. For the wake we reconvene to the village pub, just up the road from the nuclear power station. The downstairs function room is ours for the afternoon, and somewhat rammed, making it hard for the bar staff to emerge with plates of sandwiches, crisps and sausage rolls. An evocative selection of photos is on display, including one showing my uncle grinning outside a 60s holiday chalet, and a family group dressed in fashions that can only be from 1988 (plus or minus twelve months). A vase of flowers topples and has to be mopped up. Drinks are served, mostly in pints or teacups. The throng splits into family and former work colleagues, the latter being the larger group, which seems highly appropriate in the circumstances. I get the opportunity to talk to family members I haven't seen since the last funeral, or in four cases have never met at all, despite being relatively close. There is much to discuss, including Tottenham's new stadium, what the green bits in the sausage rolls were, and that lovely singing by the granddaughter. The two youngest attendees dash off to hang from the climbing equipment rather than have to keep talking to the adults. A veil of cloud rolls over. My aunt is taking everything in her stride, having put down the box of tissues she was clutching earlier, and everyone agrees we really ought to meet up sooner rather than waiting for some other unspoken event to occur. If my two other aunts are reading, see you down the pub for lunch. Borough museums: Excluding the City, London has 32 boroughs. Some of these have their own museum devoted to telling the story of the borough's local history, and some don't. By my calculations about 40% don't, which is an unexpectedly high proprtion given that the average London borough has a population the same size as Newcastle, Brighton, Derby or Hull. Or it's an unexpectedly low number given that cash-strapped councils are being forced to make savings, and culture's an easy non-essential to cut. Here's an updated version of a list I first attempted ten years ago. 400 objects housed in an upstairs gallery in the new Willesden Green library. Large ground floor gallery at whatever the library's called these days, with an immigration focus. Modern basement under Finsbury Library, with an artefact-led community focus. Top class historical repository on the second floor of the Old Town Hall. Former workhouse, with a focus on transport and the domestic, plus a rather nice small garden. 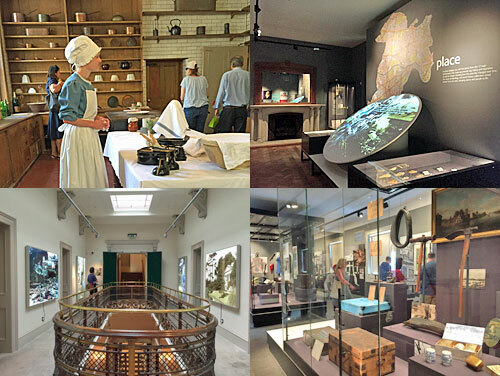 Last weekend saw the grand reopening of Gunnersbury Park Museum, after a long closure and a splash of Lottery cash. Hurrah! The History bit: In 1760 a Palladian mansion, a little beyond Chiswick, was bought by George II for his favourite daughter Princess Amelia. She used it as her summer retreat and landscaped the estate, only for the main house to be demolished soon after her death. In its place were built the unimaginatively titled Small Mansion and Large Mansion, the second of which was purchased in 1835 by the financier Nathan Mayer Rothschild. The family lived here at Gunnersbury for the next ninety years, extending the estate and inviting the political establishment and nobility and round to grand parties. They added stables and an Orangery, built a gothic tower by the lake to act as a boathouse, and laid out Japanese and Italian gardens to impress guests. Then in 1925, after the death of the third generation, the Rothschilds moved out. 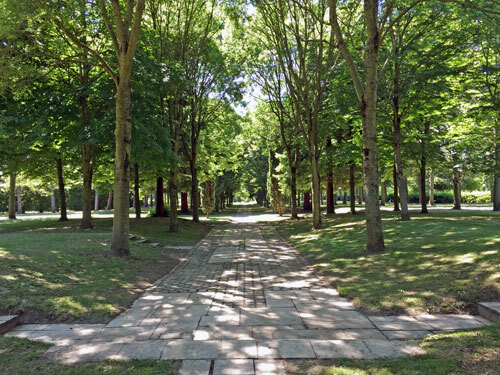 They sold up to Ealing and Acton councils, which helped to protect the estate from being turned into streets of residential housing, and a 200 acre public park was created. Neville Chamberlain came to open it, and in 1929 the Large Mansion was duly reimagined as a museum, which is now under the joint control of Ealing and Hounslow councils. The Lottery project bit: For years the mansions at Gunnersbury have been looking somewhat worse for wear, and had slipped onto English Heritage's at risk list. Thankfully a £4.7m restoration project got the green light four years back, covering not just the main buildings but the entire park. The Large Mansion was the centrepiece for phase 1, along with general upsprucing for the Orangery, Temple, and Bathhouse. I can confirm they're all looking in much better shape than they used to be. Coming next year is a major outdoor sports hub, including multi-use sports centre, gym, and floodlit artificial grass pitches. But the Small Mansion and Stables remain in a poor state, as councillors seek development partners for what'll likely be commercial ventures. The museum review bit: For those of us who've been round before, it's quite a change. Entrance is through a bright reception area (with improved gift shop), with steps up to the main galleries and a hallway through to the downstairs rooms. 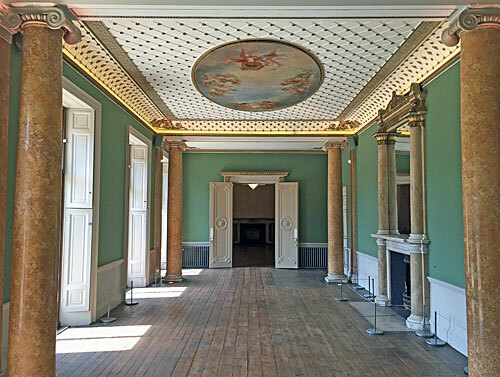 The drawing room, dining room and long gallery have impressive decor, as befitted their status as the Rothschild's entertainment spaces, but are otherwise empty. I assume this enhances their status as hireable spaces, to bring in a bit of revenue as and when. 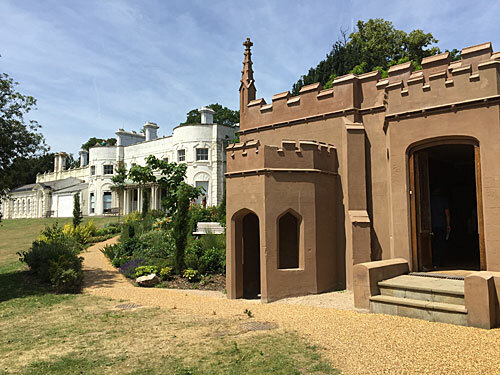 Anyone willing to linger for ten minutes also gets to enjoy an audio-visual experience projected large onto one wall, as five historical vignettes from Gunnersbury's Victorian heyday are played out. Where the building truly springs to life is in the Historic Kitchens at the far end of the house. These include a top-of-the-range range, some unreliable gas burners, and the extra office the Rothschilds bought for their two French chefs to stop them running away to more prestigious jobs at London hotels. A really nice touch is the use of proper fruit and veg, in bowls and baskets, rather than the usual plate of unconvincing models. For those of us visiting on the opening weekend, a couple of Victorian scullery maids were kept busy explaining how the whole place worked, whereas the virtual butler will give you his rundown on staffing a big house any day of the week. Which brings us to the galleries. The downstairs one focuses on 'place', with a big map of the combined boroughs of Ealing and Hounslow, plus a video history (which ill-advisedly starts with a big spiel about the land bridge from Europe, rather than anything genuinely local). The 17 main settlements hereabouts are each represented by a historical figure, clearly chosen for their diversity rather than by any independent measure of importance. Just over half are women, from Queen Elizabeth I and Ada Lovelace to a motorsport race engineer (representing Perivale) and Brentford Women's Football Club's first Asian player (representing Cranford). Further galleries can be found upstairs, accessed off the Skylight Corridor. One focuses on 'home', in a fairly lightweight manner, affording Brentford FC as much importance as various world religions. 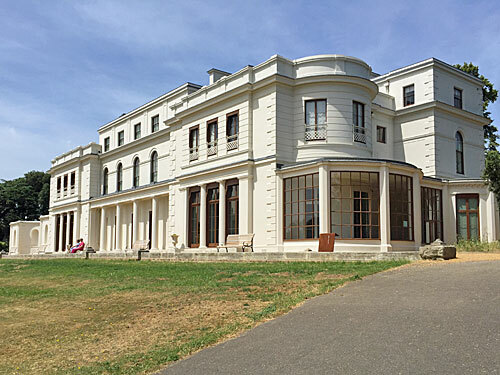 Another looks at the area's contribution to film and TV, which thanks to Ealing Studios is considerable, and it turns out The Lavender Hill Mob was partly filmed here at Gunnersbury Park. In good news, the photograph of seven Cybermen waiting for the number 65 bus has survived the museum's overhaul, alongside a green mask from The Robots of Death. Be sure to go to the very top floor for the fashion gallery and my favourite room focusing on industrial heritage. A heck of a lot of stuff was once manufactured hereabouts, from Hoovers to Gillette razors and beer to Lucozade. But that's your lot. Lovely though the new displays were, I got the feeling their combined weight was barely scratching the surface, and there are so many more stories which could be told of life in two boroughs whose combined population exceeds that of Bristol, North Yorkshire or Cambridgeshire. 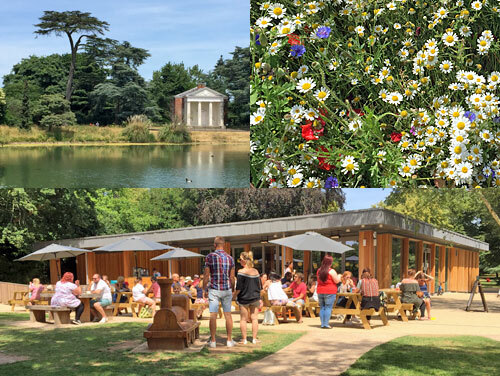 The outside in the park bit: As the former private estate of a super-affluent Victorian banker, Gunnersbury Park has the edge over your average municipal recreational space. The most formal section is close to the house, with a couple of ornamental lakes, shady lawns and a restored bath house once used by Princess Amelia. The latter is usually locked, but on opening weekend we were allowed inside to meet a costumed character and peer through a flinty arch into her white-tiled pool. Head further out to find the community garden, a lot of long-established woodland and a private fishing lake, plus probably the finest wildflower meadow I have ever seen in London (its lush midsummer display only partially disfigured by stomping photographers unsatisfied by a photo from the perimeter). The refreshment bit: Yes, there's a new cafe near the main gates. It's been open since March, because nobody likes waiting for coffee and cake, and is being run by upmarket franchise-grabber Benugo. The prices are a lot higher than the homelier cafe it replaced, which has angered several long-term users, but the front terrace was packed out in the weekend sunshine all the same. Nearest station Acton Town, if you're planning on coming down, which if you're a resident of Ealing or Hounslow you definitely should. Rather than engineer new content about Heathrow's third runway, which MPs voted in favour of last night, allow me to link back to some old stuff I've already written. This is excellent because a) the old stuff is still relevant, b) it allowed me to go down the pub last night rather than write anything new. Also c) I know 99% of you won't bother to click through and read any of it d) the usual crowd will still leave all the same comments they would have written anyway. » A brief history of London's airport expansion (October 2016): From the 1920s to the present day, in handy tabular form. » A history of the development of Heathrow Airport (December 2013): From the village of Heath Row to the world's busiest airport. » Harmondsworth (May 2014): A visit to the semi-doomed medieval village, and its Great Barn. » The Heathrow Biodiversity Site (June 2015): The eerie publicly accessible greenspace just west of the airport, now due to be swallowed whole. » Plaistow Airport (May 2012): 10 reasons why London's next runway should be in E13 instead. » Third Runway scrapped (March 2021): Prime Minister Johnson stalls Heathrow expansion by announcing bold plans for a Channel Bridge. This is not most people's view of Milton Keynes. But before the planners drew their lines across the map, several small villages were scattered amongst the fields where the new city now stands. These included Broughton, Bradwell, Woughton on the Green, Little and Great Woolstone, as well as Willen where the big lake ended up. And there was also a small parish called Milton Keynes, just off the Newport Pagnell Road, whose name was borrowed to apply to the entire twenty-thousand-acre site. In the Doomsday Book, the manor was called Middeltone. In 1166 it passed by marriage into the hands of Hugh de Kaynes, a Norman landowner, and so became known as Middelton Kaynes. Milton Keynes is a 15th century contraction. If Mabel hadn't married Hugh, the new town would have been called something completely different. All Saints Church dates back to 1330, on the site of an even older building from the turn of the 13th century. I tried hunting for the medieval fishponds immediately to the west, but in this parched weather there was no obvious sign. On the village green is a village sign, still using the old name, and a small village hall housed in the old village school. The cricket pitch looked pristine. The former heart of the village is just down the lane, outside The Swan Inn. Not only is it 13th century, it's also thatched, and requires taller clientele to duck their heads on entering. The tables out front are well frequented on sunny afternoons. Down the road is the obligatory red telephone box, and a shelter which looks like it was once a bus stop. The last surviving shop is a barbers. The Post Office may be long closed, but now comprises half of a very pretty thatched cottage. 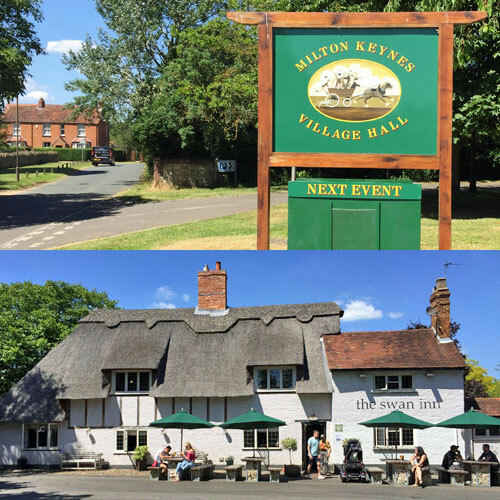 If you fancy a walk round the original village, try the Milton Keynes Virtual Trail hosted on the Two Villages Archive Trust website. The rural illusion is convincing, but you only have to drive a short distance down the road to reach modern Leys, Closes, Crofts and Drives. Connection to the wider world is via the Griffith Gate roundabout. 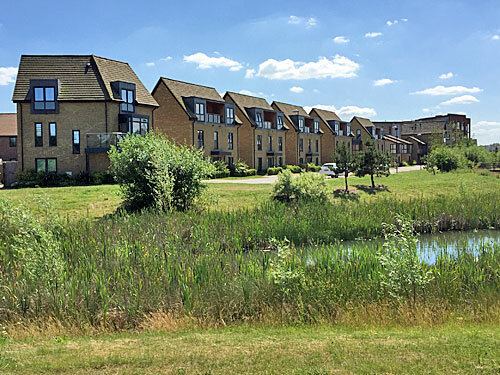 Indeed the village has been entirely absorbed into the Middleton neighbourhood, whose name harks back to the original name of the village, before it was Milton Keynes. On the other side of the parish is Oakgrove, one of the new town's newest neighbourhoods, and where Waitrose have chosen to site their out-of-town megastore. The developers named it after a clump of trees on an 17th century map, rather than adopting the perhaps more honest option of Formerquarry. Street names include Pixel Avenue, Cyber Avenuue, Abacus Drive and Wizard Way. A Show Home and Sales Centre await potential buyers, with prices on the 4 bedroom detacheds starting at £675,000. The family homes already built along the edge of the reedy flood relief channel look less Milton Keynes and more Barking Riverside. But there are tunnels for the newts, so that's good, and the peace of Ouzel Valley Park is only a short distance away. The driving forces behind housing growth change, but never disappear. The largest building in town, and undoubtedly the longest, the Shopping Centre opened for business in 1979. 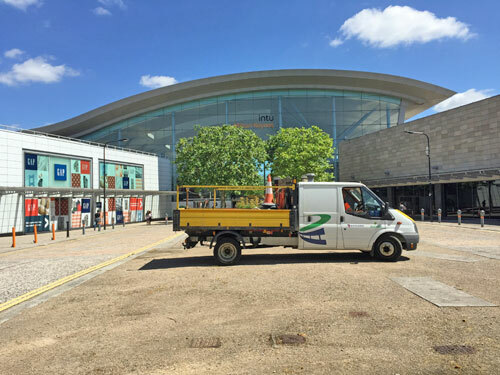 Officially it's now called thecentre:mk, but let's pretend it isn't. It comprises two half-mile-long parallel arcades, intermittently linked, with M&S as the anchor tenant at one end and John Lewis at the other. House of Fraser will be moving out early next year. The centre's big strength is that everything's at ground floor level, larger department stores notwithstanding, with delivery access hidden away on the first floor. I used to come here in the 1990s to do my Christmas shopping - two circuits and I'd hopefully be done. The light and airy arcades still look much the same, although some of the tropical planting and bench seating has been whipped out to be replaced by stalls selling mobile phone cases and churros. My favourite spot was Queen's Court, the outdoor enclave officially opened by Her Majesty, as an inscribed plaque near the sliding doors attests. It also shows the direction of sunrise and sunset at the two solstices, confirming the solar backstory of the fledgling city, as well as aspects of public realm since deleted to create a food court in the space instead. The original pergola, podium and lawn are now empty space, the enormous fountain pool has been reduced to a thin water feature, and the Vox Pop statue has been shunted into a corner where Carluccio's and Cafe Rouge don't need seating. The whole place smells of bratwurst. But the centre's still a popular destination, kept fresh by incremental reinvention, and I did a full circuit for old times' sake. Before 1985 the UK had no multiplex cinemas, this being the first, the brainchild of US entertainment magnate Stanley Durwood. It looked amazing too, a red steel ziggurat in a prime location mid-Midsummer Boulevard, and it thrived. But then the Xscape entertainment complex opened up a block behind, with a wider choice of films (as well as the country's largest ski slope). The Point attempted to reinvent itself, including a brief period as the UK's only Easycinema, but the final curtain fell in 2015. A developer has long had plans for demolition, but coming up with a replacement scheme the council approves of is proving tricky, their last attempt being described as "garish retail shed". In the meantime a few stalwarts still disappear underneath for bingo, and the shiny pinnacle slowly decays. 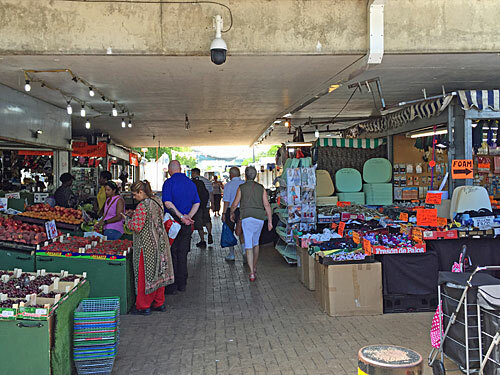 Some councils like their markets, whereas Milton Keynes shoves its into a grubby space beneath a concrete overpass. A cluster of brightly spangled stalls clings on, selling the usual fruit and veg, foam cushions and rolls of binbags. 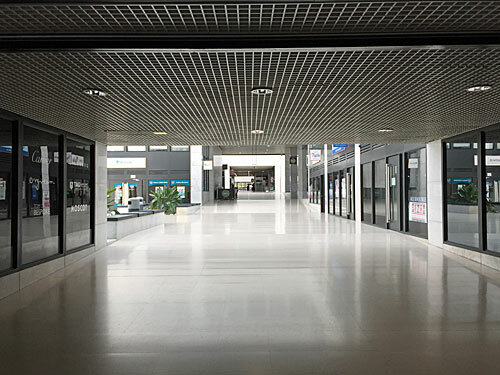 You won't get your phone unlocked in the main shopping centre, nor is there a wool trader selling Wendy, Robin and Sirdar, but it's hard to avoid the feeling you're walking round an afterthought undercroft and the unwanted corner of a car park. It seemed like a good idea at the time, to place Central Milton Keynes supermarket offering into a separate building on the opposite side of Midsummer Boulevard. I remember how sparkling it was when it opened, and how vastly amazing the Waitrose was, and my word how things change. Sainsbury's vacated in 2010, with Waitrose shifting in 2013 to a much bigger site in the suburbs, where it was easier to drive and park. Both units are still empty, the Food Centre now little more than a cheap multi-storey flanked by two overblown arcades, whose few occupied units are 'specialist stores' catering for immigrant communities. 25 years from boom to bust, that's all it takes. 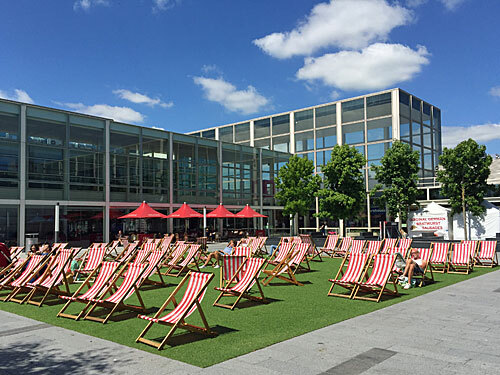 It was 1999 before large-scale culture arrived in Milton Keynes, on the final block before Midsummer Boulevard's roadway gives out. The theatre's big enough to cope with West End transfers, whereas the art gallery dumped out front was always on the small side, and looked more like a box dropped underneath a monorail. That'll be why it's currently closed for a doubling in size, and the addition of "a welcoming new café bar", which means full-on building site ambience at present. Midsummer Boulevard ends very differently for vehicles and pedestrians. Cars and buses get to drive up to a roundabout on Marlborough Gate, then weave off to join the main city network, whereas the pavement dips down between the carriageways to duck underneath. This, if it needs restating, is another reason why coming to watch the solstice sunrise from anywhere along Midsummer Boulevard is intrinsically pointless. 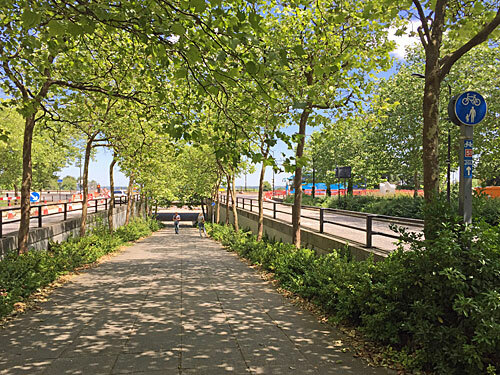 But pass beyond the concrete pillars, and the sheltered row of tents for the homeless, and the path suddenly filters out across the dual carriageway via a long footbridge and whoosh, you're in Campbell Park. Campbell Park is brilliant, as if the city's founding fathers picked a block on the map and said we will never build here, we'll plant trees and wild flowers and create an undulating landscape to be proud of. The park's now under the control of The Parks Trust, an independent body spun out of the original corporation when it was wound down, and they have over 5000 verdant acres elsewhere to keep an eye on too. Campbell Park's probably the centrepiece, and the 'ley line' of Midsummer Boulevard continues straight on as a central path, first hitting this impressive circular bowl. 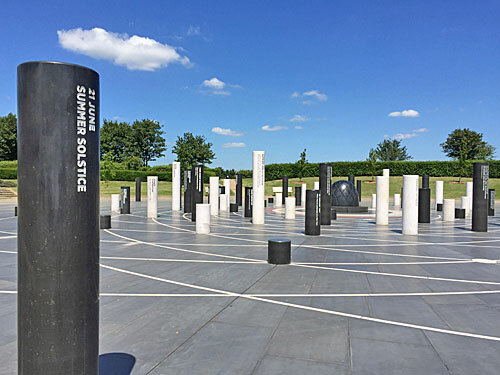 This is the Milton Keynes Rose, a cluster of 106 granite pillars of varying heights, positioned at intersections on a grid of overlapping circles. Created just three years ago, the pillars feature inscriptions marking an eclectic selection of locally important dates. One is 21 June, the Summer Solstice, obviously, but the others include 7 March (World Maths Day), 23 April 1969 (the day the Open University gained its Royal Charter) and 3 September 1978 (the day the concrete cows were unveiled). My personal favourite is 5 July 1953 (First Tea Bag Day), a manufacturing claim to fame from Bletchley, closely followed by an unnamed date in June (Knit In Public Day). You can see the full list here, and 42 pillars remain blank awaiting future dedications. If you continue past the cattle grid, the path eventually peters out on an artificial peak called The Belvedere. 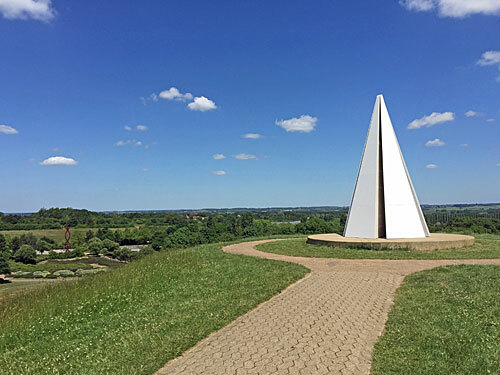 This used to be empty, with only the panoramic view to sustain interest, but in 2012 a 'Light Pyramid' was added, comprising five white triangles rising to a central peak. It's occasionally illuminated at times of special celebration, and its pure colour allows local art critics to graffiti the flanks with expletive reviews. This, officially, is where Midsummer Boulevard terminates, but a desire line path slips down the mound for those who wish to continue through the meadow. I continued. It's hard to follow the alignment from this point onwards, as it crosses a stream, a fenced-off cricket pitch, the Grand Union Canal and the mini-roundabout at the heart of the David Lloyd Health Club car park. But there is one last symbolic spot, the Milton Keynes Tree Cathedral, whose nave follows precisely the same line we've been traversing since the station. It was planted in 1986, using hornbeam and lime for the nave, cherry for the side chapels and evergreens for the central tower, and is laid out as an exact copy of Norwich Cathedral. You can have your ashes scattered here, if mystic symbolism is your thing, in the peace and quiet of a highly imaginative city. Wedged between the A5 and the city centre, this busy station was only added to the West Coast Main Line in 1982. More functional than inspirational, it only springs to life as you step out from the ticket hall into Station Square, which is where the low-density skyline of Milton Keynes first hits. Three sides are bounded by a huge C-shaped office block, and the other is wide open, with Midsummer Boulevard stretching off beyond. The office blocks appear to be fully constructed from oblongs of glass, so reflect the clouds dazzlingly on a fluffy cumulus day. The Canal and River Trust are ensconced on one side of the entrance, with Santander a little further down, while other doors around the perimeter lead to echoing foyers below acres of empty desk space. Look more closely and all the usual little shops are here, from a Greggs to a bookies, while the homeless appear to have moved in beneath one convenient overhang. Station Square itself is vast, its piazza sliced by drop-off zones, bike racks and taxi ranks. It once doubled up as the front of the UN in the film Superman IV, and a certain sense of spectacle still pervades. The town's original bus station was built on the far side of Station Square, a distance which proved a little too far to be practical. Buses now pull into generic stands either side of the main station entrance, and the old freestanding concrete pavilion stands empty. It still looks amazing, with its deep-slung canopy and exposed steel girders, hence the Grade II listing, but that's made the interior hard to let. 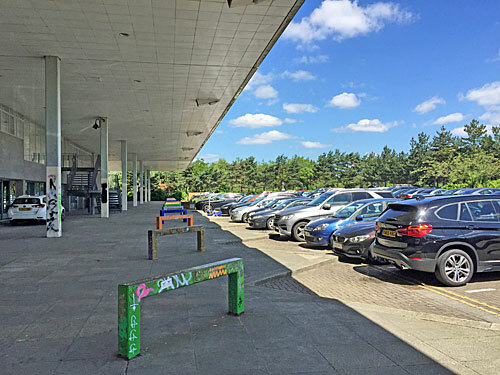 They've tried using it as a nightclub and cultural centre, but today only the skateboarders cavorting outside bring the place to life, and the surrounding tarmac (ironically) has become just another MK car park. 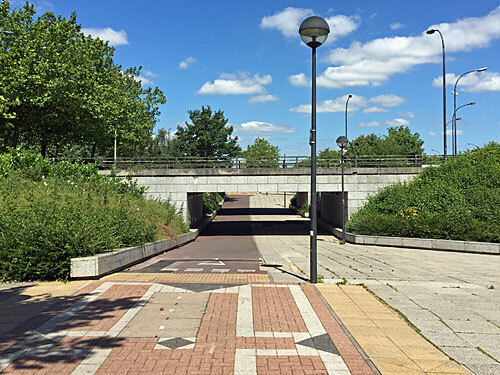 Milton's Keynes' famous network of segregated shared-use paths covers the city. One dips beneath the start of Midsummer Boulevard, just past Elder Gate, accessed via the briefest of subways. The idea is that you can walk or cycle anywhere in consummate safety, although the distances involved make cycling the more sensible option. Santander Cycles are in town, with a less chunky bike than that used in London, and docking stations somewhat irregularly scattered. That said, the prime rule of Redway etiquette is that users must always give way to road users, because in Milton Keynes the car remains very much king. You can tell cars rule because pedestrians aren't supposed to walk up Midsummer Boulevard, only to follow the pavements some distance to each side. 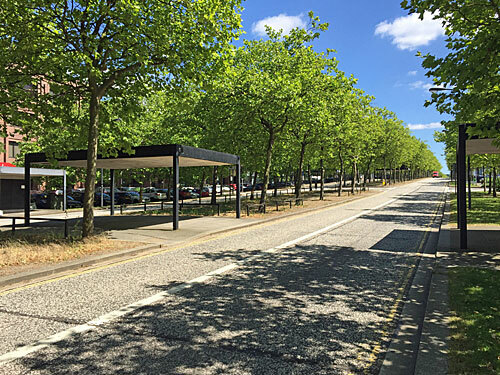 The dual carriageway does have a central reservation, shielded between two lines of lush identikit trees, but it's not for walking up, only across. The official crossing points are marked by large black canopies - officially porte-cochères - with just enough low metal barriers elsewhere to prevent joyriders driving up onto the grass. I walked up the middle, obviously. To either side is MK's CBD - a motley assortment of office blocks, some rebuilt taller than was originally permitted. Staff pop out for a smoke, or to collect their lunch from the M&S sandwich van, then wave their lanyards before disappearing back inside. And parking is easy, indeed a lot of central Milton Keynes looks like a car park, because that's how the place was designed. Parking costs 50p an hour (or £2 an hour if you slip into one of the premium zones to keep the walk to the shops down). Beneath one of the newer blocks, looking more Minecraft than most, lies a shopping arcade called Midsummer Walk. It's in the heart of the hotel zone, so was established with a leisure and lifestyle vibe in mind. The odd posh nailbar survives, and the Chinese restaurant out front looks like it still pulls them in. 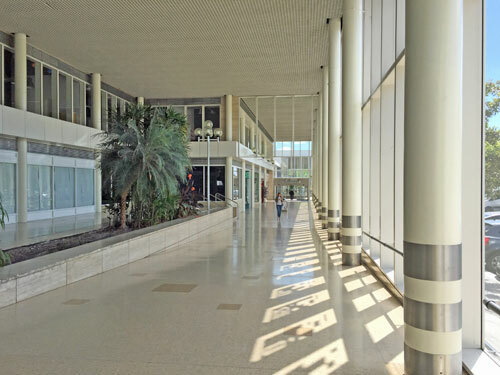 But the interior mall is essentially dead, like some ghostly walkway on the wrong side of a Middle Eastern airport, fronted by shops to let, a lonely dentist, and one of those studios waiting for anybody to pop in for a Group Photo Experience. Milton Keynes isn't averse to a bit of public art, and here's a piece making a particularly relevant nod to Midsummer. 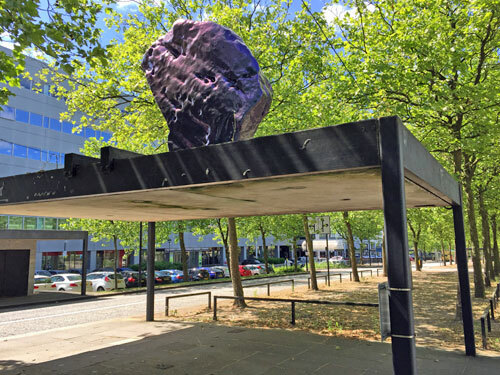 Sam Jacob has created a full-size foam replica of a sarsen stone from Avebury, painted it in iridescent purple and plonked it on top of one of the porte-cochères. "Both ancient in its references and modern in its appearance", he says, before waffling on about sculpture as a fragment of the landscape and losing it somewhat. Millennial MK-ers probably prefer the selfie-friendly hall of mirrors in the subway under Saxon Gate instead. Modern housing developments don't usually bother with churches any more. 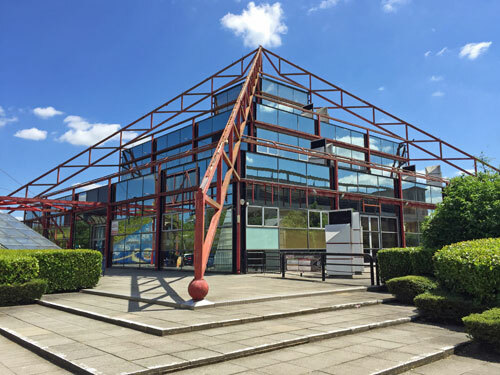 Milton Keynes waited until 1991 before completing this, the UK's first city centre ecumenical church. Christ the Cornerstone is shared between Church of England, Roman Catholic, Baptist, Methodist and United Reformed, which helps avoid redundant usage. I turned up during Prayers for Peace, so went and sat in Fred Roche Gardens instead, and mused over quite what the spiky red sculpture was intended to represent. And then Midsummer Boulevard suddenly stops. It used to carry on, across the city's highest point, but in 2000 the famous shopping centre was extended to the south, blocking the street with a lofty enclosed plaza, part-filled with inconsequential kiosks. All the extra shops are off to one side round a bland loop, and the open circus where the concrete cows used to graze around an ancient oak tree has become depressingly wildlifeless. These days they call the place intu Milton Keynes, which is just as out of character as the building itself. And this intrusive shopping centre is just one of the reasons why standing on Midsummer Boulevard to watch the solstice sunrise would have been entirely pointless. That and the multitude of trees down the central reservation, not to mention the porte-cochères, and the fact that a road pointing uphill affords no view whatsoever of the key point on the horizon. Perhaps there'll be more luck on the other side of intu Milton Keynes, as Midsummer Boulevard continues... in what'll be Part Two tomorrow. Two years ago today, the British public voted to leave the European Union. Two years on, we still have no idea what'll happen when we do. There will, at some point, come a day when the final outcome becomes clear. But we don't yet know when that day will be, nor is it easy to even guess. A lot of companies would like to know. Some aren't even hanging around to find out. An unpredictable outcome confirmed on an unscheduled date isn't good for business, making Britain an increasingly unattractive place to invest. Had David Cameron triggered Article 50 before he resigned, we'd be leaving the EU tomorrow. Nothing so certain happened. Instead Theresa May hung on until the end of March 2017, when she had to press the button to get us out of the European elections next May. And that means we'll be leaving the EU in 40 weeks time, further unexpectedness notwithstanding. But how far before 29th March 2019 will our final trading state be determined? At one point it was hoped a deal would be on the table in time for the EU Summit later this month. Fat chance. The government might get its act together and find a mutually acceptable solution in the autumn, but I wouldn't hold my breath. The EU say they need a proposition by the end of the year for their constituent nations to vote on, but they might not get it. The day we find out how Brexit ends probably won't be this year. Parliament will still want a final say, and in January the Speaker might, or might not, let them have it. Or maybe February, the way things are going, given how intractable everything is. Could Tory Remainer rebels swing a final vote, or might Labour's Brexiteer outliers swing it back? As for international trade, will any final offer coalesce around EEA rules, or Norway Plus, or some other off the shelf economic model. Or might the UK manage to come up with a bespoke compromise which suits both sides? How can anyone square the circle of the Irish border, which mustn't be Hard between north and south, but mustn't be Hard between NI and the mainland either? If we can't even agree a backstop protocol without crossing red lines, what hope is there? Our Ministerial negotiation team don't always seem the sharpest tools in the box. I wouldn't put it past them to leave the whole thing hanging until the very last minute, either through hotheadeness or as an act of brinksmanship. Imagine getting to the last week of March with nothing yet agreed. It could still happen, indeed pretty much anything could. We could slip into the so-called transition period with no confirmation of what the end state will be. Transition's currently scheduled to drag on until the end of December 2020, but even that's a moveable feast, and probably just prolongs the indecision even longer. How many businesses might have taken flight by then if, as some claim, even twenty extra months won't be long enough to get all their preparations together? But the outcome which hangs most heavily over these deliberations is crashing out with no deal whatsoever. All this political game-playing could still end with nobody being willing to compromise, or back down, and every postulated solution coming to naught. That would bring into play the notorious cliff-edge scenario, as we crash out of the EU on WTO terms, and innumerable frictionless agreements abruptly unravel. I've been nervous about the 'no deal' option ever since Cabinet members started spouting the line that "no deal is better than a bad deal". The definition of a bad deal is wilfully subjective, and could be attached to any marginally imperfect negotiation where the degree of subsidy, or nuance of immigration, or extent of legal jurisdiction, wasn't deemed quite right. It's almost as if we're being softened up for the idea that crashing out of the EU in an unplanned manner would be just fine. Only two groups of people would be happy after a no deal outcome. One would be the Evangelical Brexiteers, for whom the only thing that matters is that we leave the EU and its constitutional shackles, and absolutely nothing else matters. And the other would be those intent on smashing our current economic structures and remaking society to their own advantage. If the left were in power they'd have plans for unfettered Corbynism on a grand scale, but they're not. Instead we're on track for a super-capitalist state focused on anything-goes trade, in which existing systems would be forced to adapt or break, solely for the benefit of a few opportunists mopping up the wreckage. I genuinely fear a no deal outcome, and it remains very much at the back of the table. Two years on from the referendum, we continue to exist in a vortex of political and economic uncertainty, our nation's future direction yet to be set. It seems two years ago we weren't voting for an outcome, we were voting for a headline. Only when the dust finally settles, one unknown day, will we learn what that outcome actually is. Yesterday the Mayor of London launched "a new online property portal that offers Londoners a one-stop shop where they can search for an affordable home to buy in the capital." n.b. It actually went live in April, but it launched yesterday. n.b. Further phases of the portal will launch later this year. "The portal aims to help Londoners who can’t afford to buy a home on the open market, with all homes funded through City Hall affordable housing programmes being advertised on the site and new properties being continually added." n.b. This isn't for people who read the Evening Standard's Wednesday supplement. This is for people who can't get onto the housing ladder without a leg-up. That's a lot of people. "The Homes for Londoners portal already lists over 1,400 shared ownership and 230 Help to Buy properties." n.b. Yes, this is a drop in the ocean. No, it's not even a significant fraction of the 12,526 genuinely affordable homes started last year. But it's better than no portal. So I thought I'd interrogate the portal to see what it could tell me. Here's a haphazard list of findings. How many housing developments are included? About 350. The number increased from below 350 to above 350 yesterday. Several of the developments include more than one property. Others are merely a single pre-owned flat. As you can see, they're not all in London. I've cropped out the pins in Tunbridge Wells, Maidstone, Hatfield and a small village near Stansted Airport. I'm not sure why developers outside the capital are being allowed to jump on the Mayor's bandwagon. As you can see, some parts of London have more properties than others. The London boroughs of Richmond, Kingston, Redbridge and Havering only have 2 apiece, Bexley has 3, Sutton 4, Hillingdon 5, Bromley and Enfield and Barking & Dagenham 6, and Barnet 8. Outer London appears to be appallingly represented. Annoyingly, if you search for the cheapest property, the list includes all those with "price TBC", some of which look really expensive. I can only find three properties in London for less than £200,000. One's a 30 year-old flat in Thornton Heath for £195,000. One's for over-55s only in Mitcham. And the cheapest is a 1-bedroom flat in Bedfont, two miles from the nearest station, for £170,000. Don't all fight for it. The website says it's a 1-bedroom flat in North Harrow, for £2,502,222, but that's because there's an incorrect value in the database. As for the £895,000 house in Cricklewood, that's already reserved. As for the £850,000 property "in the old iconic St Ann's police station" near Seven Sisters station, I believe that's been sold. Which leaves this £817,000 2-bed apartment at West View Battersea at the top of the pile. Seriously, how much? How is any of this affordable? Shared ownership, that's how. You don't have to buy that West View Battersea home outright, you can buy 25% for £204,375. That sounds almost doable. The catch is that you'd need a "guidance household income between £72,869 - £90,000 per annum... plus savings of £40,875", and hey presto the whole thing's wilfully unaffordable again. No really, how is any of this affordable? Shared ownership, but you don't buy the most expensive property, obviously. How about a 2-bedroom flat at Weavers Quarter in Barking? It'd be £255,000 to buy outright, but a 30% share could be yours for just £76,500. Or a 2-bedroom flat back out in Bedfont, where 35% of £260,000 works out at just £91,000. They're a lot more promising. But because you have to pay a share of the mortgage and a chunk of rent, not to mention a monthly service charge, they still require "a guidance income of £37,000", which is well above the average wage. Blimey, a ground floor studio flat at the iconic Isokon Flats? A 50% share for only £200,000? That's many people's dream home. This isn't quite what I was expecting on here. What about somewhere a bit more ordinary? I thought I'd search my home postcode of E3. What's available on my doorstep? Nine properties. 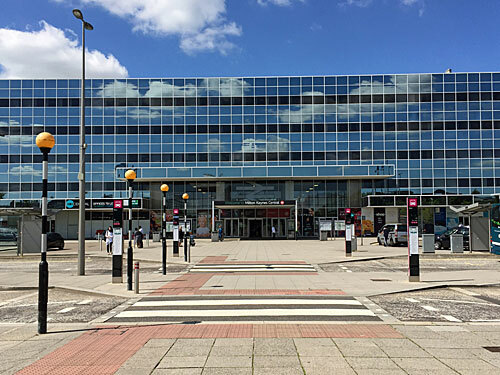 » £108,750 for a 25% share of a 1-bed flat on St Paul's Way. » £120,000 for a 25% share of a 2 bed apartment for the over 55's, overlooking Bromley by Bow station. » £137,500 for a 25% share of a 2-bed flat on Fish Island. 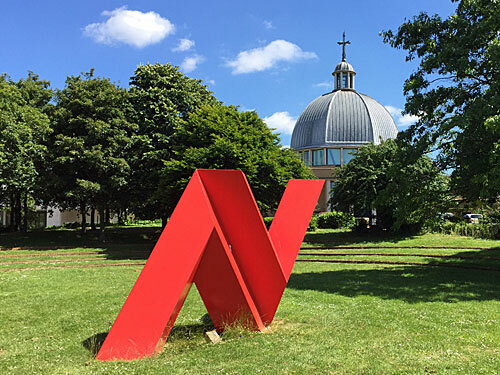 » £201,250 for a 35% share of a 2-bed apartment not quite overlooking Victoria Park. » £272,250 for a 55% share of a 2-bed flat down Devons Road way. » Something not yet launched on St Paul's Way, all prices TBC. What else can you find on the portal? Have a dig. Take a look for yourself. But it's not a lot, is it? London has 2.4 million renters. This portal doesn't yet have 1500 properties. And most of the renters couldn't afford most of the properties anyway. The portal's a start. But unless you have the good fortune to be able to grab one of the handful of so-called bargains, the concept of affordability remains an unattainable dream.